How big is a TUB? Can I get more than one TUB? How long can I keep my TUB? What can I put in my TUB? What can't I put in my TUB? What happens to the items I put in my TUB? How do I pay for my TUB? Where will you put my TUB? Can I move my TUB? Can I fill my TUB to the top? How soon can I get my TUB? When do you pick up my TUB? All TUBS are the same size and hold 3 cubic yards, but we can deliver 1, 2 or more TUBS at a time to meet your needs. You will receive a discounted rate for multiple TUBS delivered at the same time and picked up at the same time. The depth is about 3 feet 6 inches. At the top, it is about 4 feet wide and 8 feet long. At the bottom, it is about 3 feet wide and 6 feet long. Click here to see a picture of a TUB. If you require more volume, we can deliver multiple TUBS at the same time at a discounted price giving you 6, 9, or more yards of volume depending on your specific need. The price includes a rental period of up to 7 days. If you havent finished filling your TUB after this period, you may extend your rental. You can extend your rental for $50.00 per week per TUB. 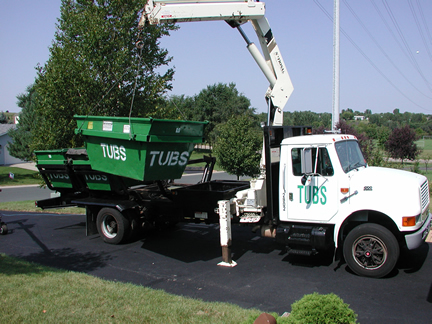 TUBS, Inc. offers three load types to suit your disposal needs. 1. Mixed Load TUB in which we can take household items, remodeling debris and yard waste. We accept appliances, electronics such as computers, computer monitors and televisions, and tires, but there are additional charges for these items. We do not accept toxic & hazardous wastes such as paint, oil, batteries fluorescent light bulbs, ballasts, or chemicals of any kind. We do not accept food waste or railroad ties. Click the following link to view our mixed load restrictions Mixed Load Restrictions. 2. Construction Load TUB in which we can take construction and demolition debris only including carpet and cardboard. We do not accept yard waste or household junk in our construction load TUBS. Click the following link to view our construction load restrictions Construction Load Restrictions. Lawn clippings (no sod), tree and bush branches and leaves. Click the following link to view our yard waste load restrictions Yard Waste Restrictions. What cant I put in my TUB? By law, we cannot accept any toxic or hazardous waste (i.e. paint, oil, batteries, chemicals, insecticides, herbicides, pesticides, asbestos, chemicals, fluorescent bulbs or ballasts). We also do not accept food waste or railroad ties. In a Construction Load, restrictions also include household junk, tires, appliances and yard waste. In a Yard Waste Load, restrictions also include sod, household junk and construction debris. We are committed to the environment. We sort all materials in your TUB and recycle what items we can (such as lumber, metal and cardboard) and we donate usable items (such as clothing, sporting equipment and kitchen utensils) to charities. Price is determined by 3 factors: the type of material you put into the TUB, and the number of TUBS ordered for delivery and pick-up at the same time and the county the delivery will be in. Prices include all delivery and pick-up fees, disposal fees, taxes and a rental of up to 7 days. Call us at 612.825.TUBS (8827) for pricing details. Payment is required upon delivery. Cash, check, Visa or Mastercard accepted. TUBS are delivered with a crane for convenient placement options. Click here for a picture of the TUBS crane. The crane can lift the TUB approximately 15 feet from the truck. Therefore, we can lift the TUB into your yard or driveway up to 15 feet from the street or alley. Or, if you choose to have the truck drive on your driveway for closer placement, we simply require you to sign a damage waiver. All TUBS are placed on your property so no permits are required for placement. We do not place our TUBS in the street. Click the following link for a copy of our damage waiver, pdf version or html version. TUBS drivers always take normal precautions while picking-up and delivering TUBS. However, delivery trucks are large and heavy, and the condition of your driveway along with changing weather conditions can make your driveway, sidewalk or yard vulnerable to damage. Click the following link for a copy of our damage waiver, pdf version or html version. The TUB itself is flat-bottomed and weighs about 500 pounds so it should not cause damage. If left on the grass or driveway for much more than a week, it could kill the grass or cause a rust stain depending on the time of year. However, this damage might be avoided by placing 2x4s under the TUB. We do not provide 2x4's, but our driver will place your TUB on them if they are provided for us. No! We will do our best to place your TUB in a convenient spot as you request. Once we have placed it, you may not move it. Moving the TUB causes wear and tear, and if it is moved, we may not be able to reach the TUB with our crane for a safe pickup. Heavy materials such as concrete, dirt, brick, rock, sand, asphalt and sod must not fill the TUB more than 21 inches up from the bottom. We cannot lift a TUB that is filled more than 21 inches up from the bottom with these heavy items for safety reasons. You may put lighter materials on top of the heavy materials up to level full for complete use of the TUB. All materials must be inside the TUB, nothing over the top or out the sides. Safety is our main priority when hauling your TUB. We are required to cover the dumpster for hauling and cannot have anything flowing over the top. Heavy materials such as concrete, dirt, brick, rock, sand, asphalt and sod must not fill the TUB more than 21 inches up from the bottom. We deliver to a large portion of the Twin Cities Metro Area. Please call if you have questions about a certain area. Click here to view our service area. Our availability varies throughout the year. In the spring, summer and fall we normally book out 2-3 business days in advance. During the winter, we book out 1-2 days in advance. These turn around times are not guaranteed, and Fridays often fill up early due to a higher weekend demand. We can pickup your TUB anytime within your 7 day rental period. You may pre-schedule a pick-up date while placing your order, or you may call us within your 7 day rental period to schedule a pick-up. Pick-up will be scheduled within 2 business days of your call or the prescheduled date. ®TUBS is a federally registered trademark of TUBS, Inc.